ESU student LaShondra Cherry talking on her show on 90.3 WESS. As a senior here at ESU with graduation on the horizon, I still get the same comments and remarks when I tell people what I want to do for a living. “That’s really competitive,” one person would say. “You have to be a former athlete to do that,” another would chirp when I mention I wanted to be a sports broadcaster. Yet, with all these comments, one thing remains constant. 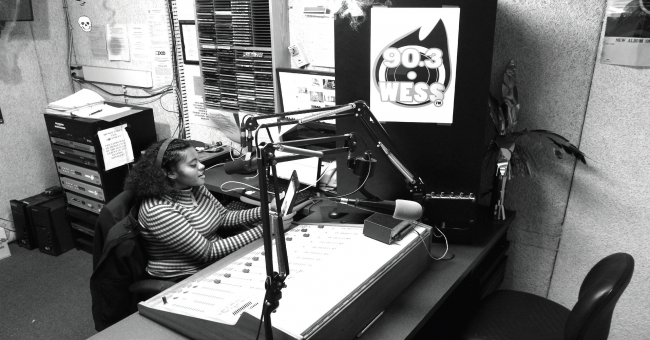 That is the vital resource that allows me to chase my dreams since I stepped foot on campus: 90.3 WESS, ESU’s college radio station. WESS is a completely student-run non-commercial radio station that has a diversified format. In other words, the DJ’s and talk show hosts may venture down any musical or topical alley they desire within the guidelines of the Federal Communications Commission (FCC). Not many college stations have such a format, which I think is a great bonus, as it allows the DJ’s to be passionate about something they already love. Along with the diversified format, the station also provides different branches within the station, such as a News Department, Sports Department, Promotions Department, and Music Department. The station has seen an increase in new DJ’s, with 52 different shows on the air. Tune in to WESS any day of the week and you can hear anything from your favorite American Top 40 hits, to classical music, political talk shows, and even sports talk shows. WESS has an on-air studio, where shows take place and are on-air and streamed online. Also, there’s a production studio to work on Public Service Announcements, fine-tune shows, create intros for shows and more. The station also includes a newsroom where news briefers provide news stories on the local, regional, and national level to the surrounding community. WESS has received national awards and recognition in the past year and a half. Last year, WESS was awarded the coveted MTVU Woodie Award for the “Best College Radio Station” in the country. Artists such as Drake, Beyonce and Ed Sheeran also won the award this past year. In addition, “College Magazine” recently named WESS one of the Top 16 College Radio Stations. It is the first time WESS has made the list. My experience with WESS has helped me tremendously in building the foundation and expanding my skills in becoming not only a sports broadcaster, but also a student of radio. I have gotten hands-on experience that isn’t offered at other universities across the country. After becoming a DJ my freshman year, I was the Sports Director for the station during my sophomore and junior year. During my time, I had the pleasure to provide the surrounding community live broadcasts of games for the football, men’s and women’s basketball, baseball, and softball teams. Currently, I am the Station Manager and over-see all of the station’s operations in conjunction with WESS’s adviser, Dr. Robert McKenzie. It has been a very rewarding experience and has expanded my knowledge of radio, as well as what it takes to be a leader. With all of the hands-on experience that I have gained to this point, I was lucky to be hired this past summer as an intern with the Triple-A affiliate for the New York Yankees, the Scranton/Wilkes-Barre RailRiders. In my time with the RailRiders, I assisted in the Media Relations Department, produced the pre-game and post-game shows, provided in-game updates, and filled in as a color analyst on both radio and television. If it weren’t for WESS, I wouldn’t have had the opportunity to intern with an affiliate of my favorite baseball team. I wouldn’t be able to hoist the Woodie Award and say that I was a part of the “Best College Radio Station” in the country. The people I have met and who have helped me along the way shaped me into who I am not only as a student and a broadcaster, but also as a person.